Idiosyncratic Whisk: Am I missing the boat on the Housing/Treasuries trade? Am I missing the boat on the Housing/Treasuries trade? The pullback in the growth of real estate loans at commercial banks has caused me to pause on the short Eurodollar / long homebuilder position. But other data is causing me to wonder if I am missing the early moves here. Today, April CoreLogic data continued to point to re-acceleration of growth in home prices. And, 1Q GDP looks like it points to a recovery in the global capital flows that draw capital into low risk American assets. I think that net imports are mainly the result of the exchange between developing economies and US corporations, where US firms take on the risk of productive assets abroad, and developing market savers consume the benefits of trust and liquidity provided by Western economies - especially the US. This leads to net capital inflows into the US, which are funded with net imports into the US. We buy goods and services, and we sell liquidity and trust in capital. 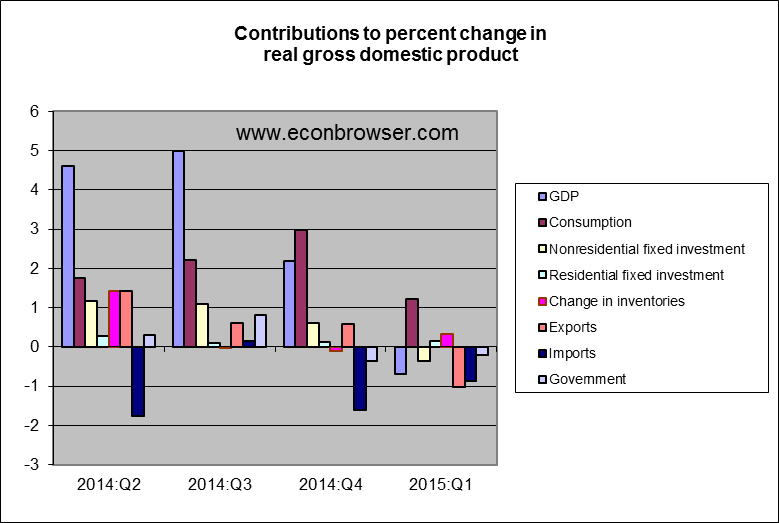 About half the drop from trend in 1Q GDP growth came from the trade deficit. We don't measure these liquidity and trust services as production. Could this foreign capital lead to housing expansion without being reflected in mortgage expansion? Maybe in the aggregate, at this stage, it can. In fact, considering that US households are still holding slightly overleveraged real estate, maybe housing price growth has to come from this capital source before leveraged US households begin contributing to the housing recovery. Question: What do you mean by the word "Eurodollar" ? Do you refer to the currency used in the Eurozone ? Eurodollar futures are the most liquid market for trading in low-risk interest rates. They are dollar deposits outside the US. It's basically the type of contract that LIBOR applies to. You can trade 3 month Eurodollar contracts as far out as 10 years at the CME, and most of them are pretty liquid. What are the primary reasons for this headline? Saudi Arabia (negative global supply shock)? The most recent increase looks like it has been mostly in real rates (since April). I have pulled out of my short bond positions, which may be a mistake. But, I'm afraid that if we don't see a resumption of mortgage growth, rates will pull back again. I may be getting unnecessarily cold feet that will cost me some gains. The re-acceleration of home prices appears to be continuing. I'll be interested in tomorrow's Flow of Funds data, to see how household real estate leverage is progressing.